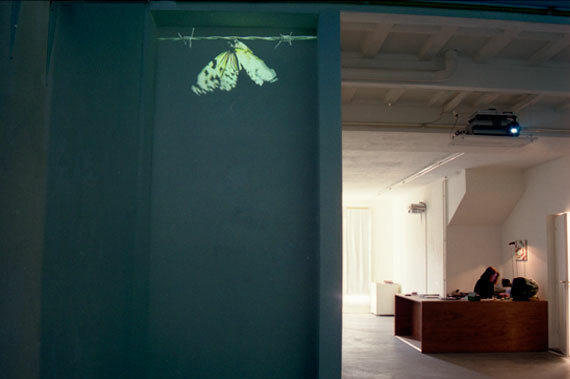 Videoprojection:"Cocoon" at Gallery van Wijngaarden/ Hakkens. can see the whole process of the butterfly coming out of the cocoon and developing its wings so it can finally fly away from the imprisonment of the cocoon and the barbed wire. The fragility of the butterfly does not only contrast with the sharp wire, it also shows the inevitability of contrasts in life. The butterfly symbolizes the soul. Its transition from cocoon to butterfly. It shows the temporary of earthly existence and the possibility to release from it.